Naperville’s first settlers lived in crowded log homes. 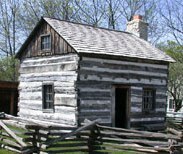 Log houses provided shelter for Naperville’s early settlers from the extreme weather and high winds of the Illinois prairies. Log houses were made of readily available natural materials like wood, stone and mud. To build a log home of this size (18 feet by 16 feet), a settler would need to cut down seventy to eighty logs of equal size. Many settlers built their log cabins with holes in the roof to vent smoke, greased paper windows and a dirt floor. But a settler might turn his log cabin into a log house by adding a hinged door, glass windows, a plank floor and a fireplace with a chimney. Living quarters were tight in log cabins, with settler households averaging six people. As soon as they could, settlers built larger frame houses like the ones they had known in the East or in Europe with clapboard siding, glass windows and a stove. 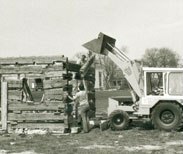 This 1840s log house was dismantled and shipped here from Jonesboro, Illinois in 1978. 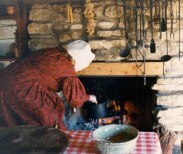 It is the only historic structure at Naper Settlement not originally from the Naperville area.